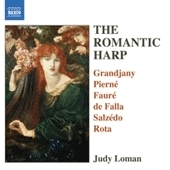 This recital of mainly late Romantic harp repertoire not only illustrates the important contribution of French composers to the genre but some of the innovative techniques introduced by composers of the early twentieth century. Concluding with the virtuosic Ballade composed by the great Franco-American harpist Carlos Salzédo, the disc includes a movement from the Harp Concerto ‘And then at night I paint the stars’ by the contemporary Canadian composer, Kelly-Marie Murphy, written for Judy Loman. The importance of France in late romantic harp repertoire will be evident from the repertoire included in the present recording, culminating in the Ballade of the great French harpist Carlos Salzédo, who went on to develop a wide range of possible techniques and sonorities. It was largely through the work of French performers and teachers that the instrument developed from an elegant salon appurtenance to an essential feature of the modern orchestra, with an independent and characteristic repertoire of its own. Born in Paris in 1891, the harpist Marcel Grandjany had his early musical training with a relative, Juliette Georges Grandjany, winning a scholarship at the age of eight to study the harp with Henriette Renié. A year later he started classes of solfège at the Conservatoire, where, from 1902 until 1910, he was a pupil of Alphonse Hasselmans. He made his Paris début with the Concerts Lamoureux Orchestra in 1909, and after a relatively brief period of military service was from 1915 to 1918 organist and choirmaster at the Sacré-Coeur Basilica. His connection with America came with a period of fourteen years as a teacher at the American Conservatoire at Fontainebleau, and, after his London début in 1922, his first appearance in New York two years later. He toured widely in Europe and North America and was co-founder of the Quintette Instrumental de Paris, for which composers such as Vincent d’Indy and Albert Roussel wrote works. From 1936 he made his home in America, taking out American citizenship in 1945. He taught at the Manhattan School and from 1938 at the Juilliard School as well as for some time also in Montreal. Distinguished as a performer and as a teacher, he also wrote a quantity of music for the harp, all of it well suited to the instrument, including original compositions and transcriptions. His Fantaisie on a Theme of Haydn, Op. 31, an introduction, theme and five variations, was published in 1953. Marcel Tournier was also a pupil of Hasselmans at the Paris Conservatoire. One of the five sons of a Paris luthier, like his brothers he followed his father’s demand that all should learn a string instrument, entering the Conservatoire at the age of sixteen. He studied harmony, counterpoint and composition with Lenepvu, Caussade and Widor respectively, and won the second Prix de Rome in 1909. He succeeded Hasselmans at the Conservatoire in 1912, continuing there until 1948, when he was succeeded by Lily Laskine. He had a strong influence as a teacher, while his compositions for the harp make a significant addition to the repertoire of the instrument. His impressionistic Vers la source dans le bois (Towards the fountain in the wood) was written in 1922. Precocious as a composer, with an oratorio first performed when he was twelve, Nino Rota studied at the Milan Conservatory, thereafter taking private lessons first with Ildebrando Pizzetti and then with Alfredo Casella. His career brought a long association with Bari Conservatory, of which he was appointed director in 1950. A versatile composer, he wrote some eighty film scores, including collaborations with Fellini, Zeffirelli and Visconti, and the score for Coppola’s The Godfather. His Sarabanda e toccata for harp, its neoclassical form suggested in its title, was written in 1945, three years before his concerto for the instrument. The Sarabande moves from a chordal opening to a feer section, while the Toccata suggests the musical language of Poulenc. A pupil of Jules Massenet and of César Franck at the Paris Conservatoire, Gabriel Pierné succeeded the latter as organist at Ste Clotilde, later distinguishing himself as a conductor, notably as deputy and then successor to Edouard Colonne at the Concerts Colonne. His Impromptu-caprice, a well-known showpiece for the harp, dates from 1887. It starts with a cadenza, before the introduction of a melody of particular charm, which is to return in conclusion, after a livelier Bolero at the heart of the work. The first Spanish Dance from Manuel de Falla’s opera La vida breve has lent itself to a variety of arrangements, whether for violin or guitar. It is perhaps even more effective in a harp transcription that adds a wider range of sonorities. The opera itself, finally recast in two acts, was first staged in Nice in 1913, when there seemed no immediate prospect of performance in Spain, where it had, in 1905, been awarded first prize in a competition for Spanish opera. The dance is heard in the second act at the wedding of Paco and Carmela, after the former’s betrayal of the young gypsy girl Salud, who, in the final scene, is to die at his feet. The French composer Gabriel Fauré studied at the Ecole Niedermeyer in Paris, where, by good fortune, he met Saint-Saëns, who was then teaching the piano at the school, and was later his deputy organist at the Madeleine. He eventually secured a position at the Paris Conservatoire, of which he became director in 1905. Fauré’s musical language bridged a gap between the romanticism of the nineteenth century and the world of music that had appeared with the new century, developing and evolving, but retaining its own fundamental characteristics. His harmonic idiom, with its subtle changes of tonality and his gift for melody, is combined with an understanding of the way contemporary innovations might be used in a manner completely his own. He made an unforgettable contribution to French song repertoire, and his Une Châtelaine en sa tour …, Op. 110, for harp, written in 1918 for the harpist Micheline Kahn, is derived from a setting of a poem from Verlaine’s La bonne chanson. The song, Une Sainte en son aureole (A Saint in her halo) continues with a second line that gives the harp piece its title, the character of the work summarised in the following lines Tout ce que contient la parole / Humaine de grâce et d’amour. Fauré’s Impromptu, Op. 86, also known in a version for piano, was originally written in 1904 for harp as a morceau de concours for the Conservatoire. The Canadian composer Kelly-Marie Murphy has won a considerable reputation and a number of important awards in her own country and in the United States. Her concerto for harp and orchestra And then at night I paint the stars …, its title taken from a letter of Vincent Van Gogh to his brother, was commissioned by the Canadian Broadcasting Corporation and the Toronto Symphony Orchestra to mark the retirement of Judy Loman as principal harpist and is dedicated to her. Its third movement, Scintillation, a title earlier familiar from Salzédo, is in the form of a cadenza that can be heard as a piece by itself, in its original context leading to the final movement of the work, Morning Sky. A musician of unusual precocity, Sergey Prokofiev completed his composition studies at the St Petersburg Conservatory in 1909, continuing there in the piano class of Anna Esipova, pupil and former wife of Leschetizky. It was in these years, from 1906 to 1913, that he wrote a set of ten piano pieces, the seventh of which, Prelude, was dedicated to his fellow-student, the harpist Eleanora Damskaya. The Harp Prelude easily lends itself to transcription for the harp itself, with romantic cascades of notes in music that lacks anything of Prokofiev’s frequent astringency. A graduate in piano and harp from the Paris Conservatoire, Carlos Salzédo moved to New York in 1909, serving initially as principal harpist in the Metropolitan Opera Orchestra under Toscanini. He was active in the promotion of new music, established the harp department at the Curtis Institute and taught at the Juilliard School. As a composer and performer he exercised a strong influence on harp performance, exploring the possibilities of the instrument and its varied timbres. His Ballade, a standard virtuoso element in modern harp repertoire, is one of a set of three pieces published in 1913, and, as a relatively early work, reflects a harmonic vocabulary familiar from the works of his French contemporaries. It was dedicated to Hasselmans, his teacher. Judy Loman studied harp with Carlos Salzedo - at the Salzedo Harp Colony in Camden, Maine, 1947-56, and at the Curtis Institute in Philadelphia - and was his assistant in the Salzedo Harp Ensemble in 1957. She moved to Toronto in 1957 and became the principal harp of the Toronto Symphony Orchestra in 1959. Her many appearances as soloist with the TS have included performances of the John Weinzweig Concerto, which was written for her, and of Harry Somers's Suite for Harp and Chamber Orchestra, which she played with the orchestra on its 1965 European tour. The TS commissioned R. Murray Schafer's Concerto for Harp and Orchestra for her, and premiered the work 6 Apr 1988. Loman appeared as soloist with the orchestra on its 1979 Canadian and US tour, and in 1987 on its tour to northern Canada and the Arctic. She also has appeared as soloist with the Calgary Philharmonic, the Edmonton Symphony Orchestra, and the CBC Vancouver Orchestra. She has given many recitals and has performed on CBC radio and TV, with the Festival Singers, at the Festival of the Sound, at the Elora and Stratford festivals, and with the York Winds. Robert Turner and John Felice have written works for her, and she premiered Schafer's Crown of Ariadne 5 Mar 1979 for New Music Concerts, playing both percussion and harp; her recording of the work received a Juno Award as best classical album of 1979, and the Canadian Music Council's Grand prix du disque. She gave the premieres of Schafer's Theseus 28 Jan 1986 with the Orford String Quartet, of Weinzweig's 15 Pieces for Harp in 1986, and of Glen Buhr's award-winning Tanzmusik in 1987 in Pittsburgh as part of the American Harp Society's annual composition competition. Some of Loman's own arrangements, realizations, and transcriptions of music for harp may be heard on her recordings. She became a member of the Faculty of Music, University of Toronto, in 1966 and established a summer school for harpists near Fenelon Falls, Ont, in 1977. Her pupils have included Gianetta Baril, Nora Bumanis, Sarah Davidson, Erica Goodman, and Elizabeth Volpe. Loman became a board member of the World Harp Congress in 1985. She adjudicated at the 1985 Israel International Harp Contest, for the American Harp Society's annual harp composition competitions, and at the 1989 USA International Harp Competition.